Revive a Drain specialise in blocked drains Melbourne services. If you’ve got sewage flooding your home, clogged toilets, overflows or any other drainage problem, we can help. And because we use the latest in equipment & technology, we don’t even need to dig. Save $50 on your first service by calling us today! We don't charge call out fees because we know we can provide the best solutions at great prices. Our plumbers are on-call 24/7 servicing Melbourne & suburbs. We can even provide same day emergency services. Because we use the latest in drainage technology & equipment, we don’t need to dig. This allows us to clear blocked drains faster, cheaper and stronger than a regular plumber can. 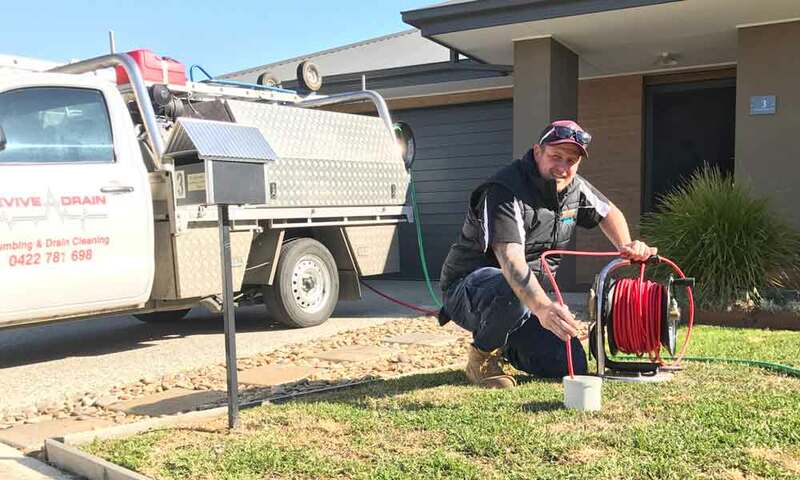 We can quickly clear your drains using our powerful water pressure jetting machine and then inspect it with our CCTV drain cameras to see if their are any cracks or breaks than need to be repaired. If a repair is required, 80% of the time, we can do it that same day within a few hours using our advanced drain relining equipment – the reason we don’t have to dig! That means no more pulling up your driveway or ripping our your garden beds. This process is faster, less expensive and will repair your drain stronger than traditional excavations & replacements. This means you’ll save money when you choose Revive a Drain for your blocked drain needs. Call us today to have your pipes repaired once and for all. Our technicians arrive onsite, on-time, and will conduct a series of tests and visual inspections of the drains around your property to identify which section of your drain is blocked. Once the technician has determined the most effective way go about clearing the blockage, and a suitable access point from where to clean the drain is identified, you will be provided with a no-obligation quote and a solution to your blocked drain. Once your blockage has been cleared, our technician will carry out a CCTV drain camera inspection of your drain, and you will be provided with a report on the cause of the blockage and the condition of your drains. Our technician will then advise you on the best possible solutions to avoid future blockages. Our technicians use our high-pressure jetting machine to cut through the toughest of blockages and tree roots. The jetting machine also cleans the complete diameter of the pipe which helps your drain flow like new. We use our CCTV drain inspection equipment to determine the cause of the blocked drain and to also identify the condition of the pipe work. This equipment also allows us to pin point the location of the issue with 100% accuracy. Our German-engineered drain relining system is the latest and greatest technology in drain repair and rehabilitation. This particular system allows us to repair cracked and broken drains without the need to excavate. We have been using this system for the past 5 years with great results saving our customers money, time and effort of reinstating driveways and garden areas from excavation. Unfortunately, some drains do require excavation. Our highly-trained team of plumbers with the use of excavators can dig up and repair all drains, all diameters and all materials. Our plumbers are highly-experienced, efficient, and very clean and tidy. For Fast Blocked Drain Services In Melbourne, Call Today! There are several causes. The most common is from flushing the wrong things down the drain, like wipes, rags, nappies, sanitary items, etc. We strongly advise you refrain from doing this! Another common cause of blockages are from tree roots penetrating the pipe and getting in the way. This can cause serious damage to the pipe & the long it’s left, the worse it gets. That’s why it’s important to sort blockages out early, before relining or replacement is needed to fix the problem. My drains are blocked. Who is responsible for maintaining & repairing them? If the blocked drain is on your property, it’s the household’s responsibility. If it’s a sewer drain on the streets, it’s not the responsibility of the household. First, check to see if you’re insurance covers it. Then, if you’re up to it, see if you can clear the blockage yourself. If you’re not up to the task, call in an expert like one of Revive a Drain’s licensed plumbers. If you find that a drain continually gets blocked, it’s possible there’s some damage. In these cases, call in an expert to double check. It depends on the size of the blockage and if there’s any damage, but we unblock most drains within an hour. Once again, this is highly dependant on the drain and whether or not there’s any damage. For that reason, we can only give you after we’ve surveyed the drain. For that reason, we offer $0 call out fees for an initial inspection so you have some peace of mind. Drain relining has been recommended. What is it and is this service necessary? Drain relining is the process of lining the inside of the drain with a strong & powerful resin to repair any damages. It’s a faster & cheaper way to repair damaged drains than replacing them and no excavation is required. When are CCTV survey's necessary? CCTV survey’s are necessary when it’s possible that drain or pipe is damaged. In these cases, we advise using our advanced CCTV equipment to find out exactly what the cause and where the problem is located so we can fix it as soon as possible. How do I prevent blockages in the future? The best way to prevent blockages is to avoid throwing anything unnecessary down the sink or toilet. That means, avoid flushing anything other than toilet paper & human waste down the toilet (no condoms, sanitary wipes, etc). And scrape food scraps into the bin as opposed to down the sink. As an extra precaution, regular drainage checkups are also recommended. Our drainage & pipe relining services are the best in Melbourne. We can repair any damaged drain and we don't need to dig! Blocked & leaking toilets are not only annoying, but can waste water & significantly increase your water bill.